Image courtesy of the Senate Historical Office George Bender of Ohio unsuccessfully sought election to the U.S. House of Representatives four times before winning a seat in 1938. 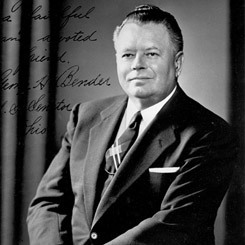 Bender served eight terms in the House before being elected to the Senate in 1954. On this date, President Dwight D. Eisenhower signed a law ending the dispute about the actual calendar day Ohio was admitted into the Union. The Ohio state convention agreed to petition for admittance into the Union on November 29, 1802. Congress approved this action on February 19, 1803, but did not complete the steps to grant statehood. The 8th Congress (1803–1805) missed a critical part of the statehood process: congressional ratification of the state constitution. One hundred and fifty years later, in the 83rd Congress (1953–1955), Representative George H. Bender of Ohio introduced the legislation on January 13, 1953, to retroactively grant statehood. Calling the mistake a legislative oversight, Bender stated, “The State constitutional convention presented the Constitution of Ohio to Congress on February 19, 1803, and Congress chose to ignore the whole business.” Without congressional approval of the state constitution, Ohio technically remained part of the Northwest Territory. The Members of the 83rd Congress poked fun at the expense of their colleagues from Ohio, claiming, as did Representative John E. Lyle of Texas, that “If Ohio is not a member of the Union and we have some illegal members of the Senate and the House here, I should like to know it.” On May 19, 1953, the House voted to approve legislation retroactively ratifying the state constitution and admitting Ohio to the Union as of March 1, 1803.